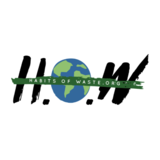 Here at Habits of Waste (HoW), we know the impact of the ripple effect. Every drop counts and can make a huge splash. The power of one is real and we want you to become a HoW changer. Your individual impact goes much farther than you think, it creates social impact. If you start a step to change the world you may not notice how many other people are affected and can help spread change with you. Think about how quickly news travels, how an item can become a trend, how tiny coins add up to big savings in a piggy bank. Every social movement and impact starts with the power of one. One person can make serious change with a simple step, a little leap, or by creating a new habit.